from £245.00 for 3 methods with kit. All courses come with unlimited post course back up to help set up your buiness! We are here to help you! for hairdressers and non hairdressers. We guarantee 100% you will be accepted for insurance or your money back! You will be presented with your Certificate and Insurance application at the end of the day, no need to wait! We uniquely offer sprecial courses for non hairdressers so you will not feel out of place amongst qualified hairdressers. We uniquely offer free unlimited post course help and advice to help you set up your business and send you any leads for your area. Extension Hair offers 10 methods of Hair Extension Training courses to choose from. We offer training to Hairdressers and non-qualified Hairdressers to enable the start of the journey of a new career or just simply for anyone who would like to learn how to put the extensions in for family/ friends. WE PROVIDE YOU WITH EVERYTHING YOU NEED TO START UP IN BUSINESS. 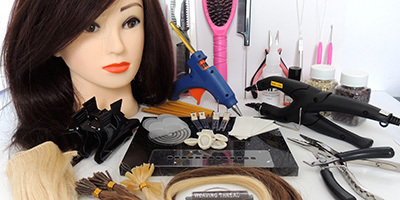 Extension Hair Courses include ALL the professional equipment you will need, including a Training Head, tools and hair to enable you to start up your own Business. Full Application and removal of your chosen method/s. All you need to know about the hair extension business. Continual post course back up when required. A list of all the hair suppliers we use. To book now, click the on the top right hand side of the page "Book Now" to pay your £50 deposit. If you need a playment plan, you can apply for 4 month payment option through paypal direct. Please message for next available dates. North West/North Wales/Chester/Wirral/Liverpool. Hair Extensions: Mobile and training centre based (Conwy). 1:1 training 10 methods avaialable (Click on methods at the top of the page) Any 3 methods £275.00 Any additional methods £75 each, including full trianing kit, training head & practice extensions. Deposit £50.00 (Non Refundable) Please message to arrange a date to suit you. Shrewsbury: Hair Extensions: Salon based. Micro Beads, Nano Beads, Tape, Micro Weft, Braided Weave, Briadless Weave, Pre Bonded Bonds. £275.00 for 3 methods, then £75 any addional methods.includes full trianing kit, training head & practice extensions. Deposit £50.00 (Non Refundable) Please message to arrange a date to suit you. Bolton: Hair Extensions: Salon Based. Micro Weft, Braidelss Weave, Sew in Braided weave, Micro rings, Tape. Any 3 methods £299.00 Any additional methods £55 each, includes full trianing kit, training head & practice extensions. Deposit £50.00 (Non Refundable) Please message to arrange a date to suit you. Shropshire/ Mid/North Wales, West Midlands: Hair Extensions: Mobile & Salon based. Methods: Bonds, Micro ring, Nano ring, Tape, Micro ring Weft. Any 3 methods £250.00 Any additonal methods £50 each includes full trianing kit, training head & practice extensions. Deposit £50.00 (Non Refundable) Please message to arrange a date to suit you. Surrey, London: Hair Extensions & Hair Mesh Intergration SystemTraining: Methods: Nano ring, Braidless Weave, Bonds, Micro ring, Shrinkies, Tape, Micro ring Weft. Any 3 methods £299.00 Additional methods £75 each includes full trianing kit, training head & practice extensions. Deosit £50.00 (Non Refundable) Please message to arrange a date to suit you. Kent: Mobile trainer. Nano Rings,Tape, Fusion Bonds, Keratin Bonds. Any 3 methods £299.00 Any additional methods £55 each, including full trianing kit, training head & practice extensions. Deosit £50.00 (Non Refundable) Please message to arrange a date to suit you. Canvey Island, Essex. Salon nased training. Methods: Nano rings, Micro Rings, Tiny Tips, Bonds. Any 3 methods £299.00 Any additional methods £55 each, including full trianing kit, training head & practice extensions. Deosit £50.00 (Non Refundable) including full trianing kit, training head & practice extensions. Please message to arrange a date to suit you. Romford, Essex: Salon Based training. Braidelss Weave £165.00 - Bonds £185.00 - Micro rings £140.00 3 methods £370.00 1:1 training Deposit £50.00 (Non Refundable) including full trianing kit, training head & practice extensions. Please message to arrange a date to suit you. Hartlepool: Salon Based 3 methods £350.00 Any additional methods £50 each including full training kit,training head& practice extensions. Glasgow: Salon based: Nano, Tiny Tips, Bonds, Micro Weft. 2 methods £345.00 3 methods £395.00 including full kit. We also offer CERTIFICATION WITH TRAINING ONLY- NO EQUIPMENT- FOR £49.99 ONLINE for people who have all the tools already and need training and Certification to gain Insurance. Hair Extension Technician’s Trainer’s Certificate... Train to be a trainer for us! Are you a qualified and experienced Hair Extension Technician? Would you like to become a trainer in Hair Extensions to add to your portfolio? Extensionhair are looking for trainers Nationwide to join our team. You will need to be qualified and experienced and be able to forward copies of your Certificate/s and also have extensive photographic evidence of you work in the methods you are wanting to train students in. Once we have completed our comprehensive trainer's assesments you wil be able to represent us as a trainer, you will recieve your Trainer’s Certificate. This will cost £99.00 for the assessment and Certificates in up to three methods. You can then advertise for students to train with you direct and train for us. We will advertise your training courses available on our web site for you. Please just ask if we can be of any further help.